Australia daylight saving time begins on the first Sunday in October at 2 AM Eastern Standard Time and ends on the first Sunday in April at 2 AM Eastern Standard Time (3 AM Daylight Saving Time). 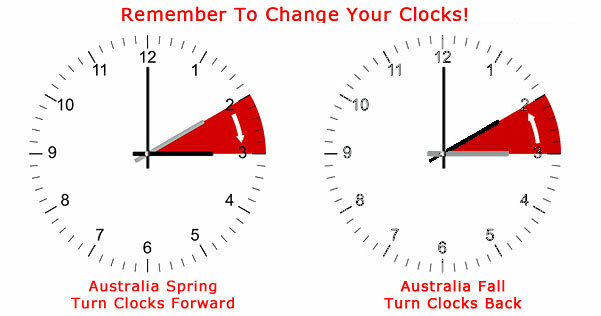 Daylight Saving Time is not used in the Northern Territory, Queensland and Western Australia. Western Australia used Daylight Saving Time is in a trial period which began on 3 December, 2006, however, in May 2009 a referendum was held in Western Australia and voters rejected the continued use of daylight saving time. The charts below shows when Daylight Saving Time begins and ends in Australia. You will sometimes see references to Daylight Saving Time ending at 2:00 AM Standard Time which is equivalent to 3:00 AM Daylight Saving Time in areas observing Daylight Saving Time. Year DST Begins at 2 a.m.
standard time DST Ends at 3 a.m.